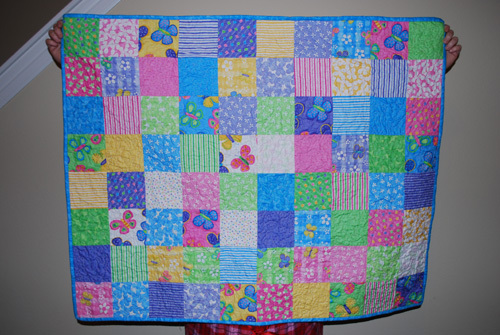 I made this baby quilt in December, 2008 for my niece, Kate who was about to be born. 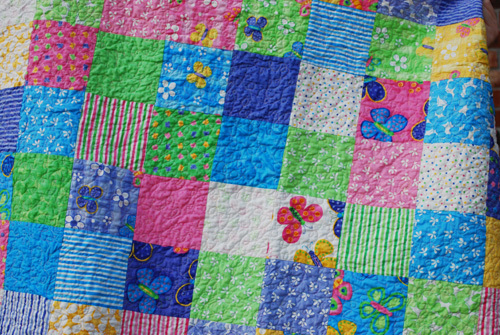 I love the colors and how cheerful this quilt is. 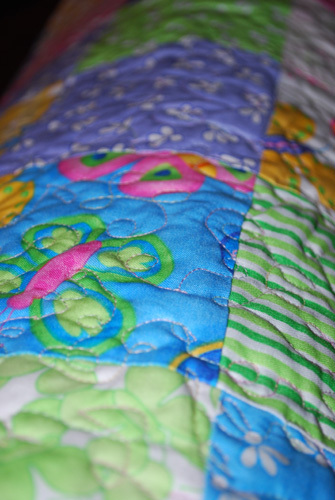 My big accomplishment with this quilt…my first experience with free motion quilting. I did a simple loop pattern, and I learned so much! The finished quilt measures about 36 x 45. It’s so nice to see this all put together! I myself have 160 charms of this! It was the first thing I bought when I decided to start quilting. They’ve been sitting in my stash for me to make a quilt for my 5yr old. I finally bought a cute pattern that uses charm squares. But of course I keep getting sidetracked on other projects. 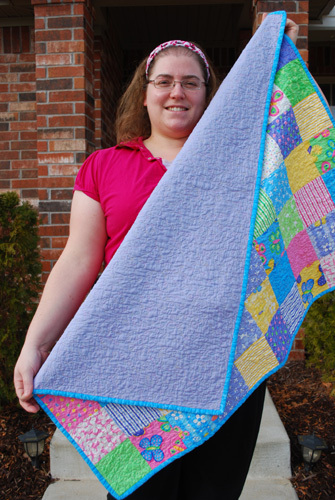 But this is really cute and I LOVE patchwork quilts. I’ve made 2 just like this one (w/ Moda’s Sultry and Sleepytime) After seeing Butterfly Fling all put together, maybe I’ll just have to bust them out and start another project! Very cute quilt! Thank you Jen! 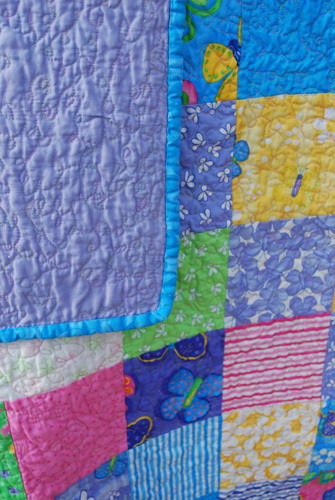 I too love charm squares, and I love the simplicity of leaving the squares as they are, so you get that cool patchwork look and can really appreciate each charm on its own. I’ve got a whole bunch of Butterfly Fling fat quarters as well as one more charm pack, and time will tell what I decide to do with them–likely a bigger version of the above quilt!